Let me start this post off by saying this: Traveling for a year with my wife, Jammie, has been the most exciting, enjoyable and fulfilling thing I have done in my life so far. Despite anything I might say below in terms of cautionary advice, my core message is this: Travel is one of the best things you can do with people you love. It brings growth like no other experience. I wholeheartedly recommend it. 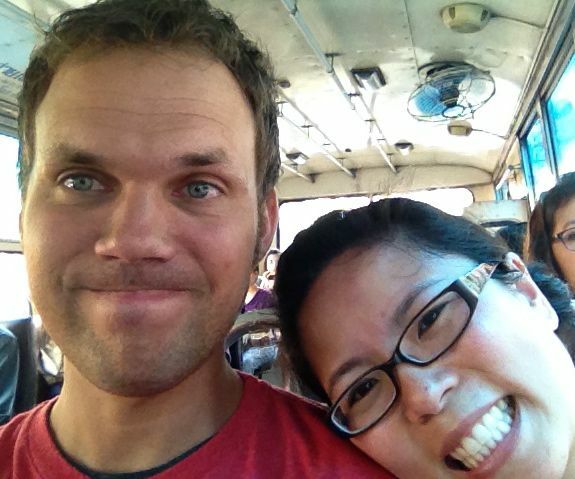 Trust your partner’s travel strengths – Jammie and I each have some key things we are good at when it comes to travel. She is great at budgeting. I trust her and she keeps us from overspending. It’s a little frustrating to be told that we can’t afford something like my pre-trip habit of doing most of my blogging from coffee shops (now I do most of it for free from home!). But ultimately, Jammie’s skill in this area and my decision to trust her has kept us out of trouble. Pre-trip prep is stressful – There’s no way around it: pre-trip planning is a stressful process. There are so many details, you are sure you’ve forgotten something and there is never enough time. Shut up and get stuff done. Don’t let the fatigue and pressure make you crack. Jammie and I have done this right and we’ve done it wrong. When we have let the pressure make us snap and get mad at each other, a lot of the magic of travel is lost. So we’ve learned to anticipate the stress and deal with it better. Share dreams on road trips – Long journeys are great for planning. As mentioned in prior posts like this one, Jammie and I have a road trip to Reno that we take every year in order to make plans for our lives. We made sure we took it this year too – right before Christmas. We talked about 2014 and beyond and actually wrote down our plans so that we could hold ourselves accountable. I am not sure what it is about traveling that lends itself so well to planning but I suspect that, like a corporate retreat, travel takes you out of the environment of the daily grind and sparks your creativity on a different level. Yelling is for kids – Travel is a lot of fun but it is also super stressful at times. When something goes wrong with your plans (lost wallets; unexpected cancellations; no sleep due to yapping dogs; horrible weather, etc.) it is tempting to take things out on the nearest person. Don’t do it. Especially when that person is someone you love. It never works. Nothing is fixed. Nothing feels better. Learn to bite your tongue and get through the difficulty rather than stamping your little feet. Sometimes you just have to laugh – Laughter works far better than yelling. Recently, Jammie and I thought we had booked an amazing deal when we flew to Kuala Lumpur for a two-night visit from Bangkok. Both the flight and hotel were included for a very reasonable price. Well, the hotel turned out to be an unbelievable dump, complete with cockroaches, loud guests and completely non-existent insulation that ensured that we got play-by-play updates from the teenagers next door as they hooted and hollered about video game victories under their clueless dad’s non-supervision. At times like these you can laugh or cry. We laughed. And then we left the room. Be careful with finding accommodation – Let’s talk a little more about accommodation. Don’t screw this one up. Jammie and I found that accommodation basically colored our entire experience in the different cities we lived in. We absolutely loved Berlin, for example, because we found a spacious, well-lit, highly functional artist’s apartment in a cool part of town. It worked out great. Our apartment in Buenos Aires, however, was cold, dark, damp, cramped and ridden with random maintenance issues that required constant attention. We hated it with a passion. It put a damper on our entire experience in what, to be fair, is one of the world’s most fascinating cities. Find alone time – One of my favorite things to do in each of the locations we visited was to go on long walks (in Bangkok my average daily walk was over 10 miles). Jammie, on the other hand, it not into urban hikes. So my walks allowed Jammie to catch up on writing and personal projects while giving me some exercise and thinking time. This allowed us alone time to process our thoughts and brainstorm solutions individually. I frequently stopped in my tracks and entered ideas into my iPhone while on my walks because I recognized this alone time as the most creative part of my day. Volunteer together – At first glance, the idea of sorting old shoes in an ill-lit Berlin basement sounded like a downer. But it actually became a fun ritual for Jammie and I since we had chosen to help sort these shoes for the homeless. Volunteering together felt great and ended up being really entertaining as we joked about the absolute un-sexiness of our service project. Wherever and however we volunteered around the world, we always left feeling recharged. It was great to be able to share that feeling with someone else. Admit when you are lost – This holds in a strictly literal sense (you’ve just led you and your partner on a wild goose chase for a famous pastry shop that seems to have disappeared from the face of the earth) or metaphorically (you are at your wit’s end and have no idea how to face a challenge). Either way, travel as a couple works better if you are straight up as soon as possible. Don’t try to be a hero, be honest when you don’t have a clue. More tips to come! – As with any journey, you learn more the further you go so I’ll keep you in the loop on future thoughts. For now though, let me end where I started: traveling with someone you love is one of the best things you can possibly do together. Whether you are a new couple, starting out in your shared life or an established couple looking for adventure, do yourselves a favor and try it out!